Today is the 5th of February and that means that it’s Chinese New Year! 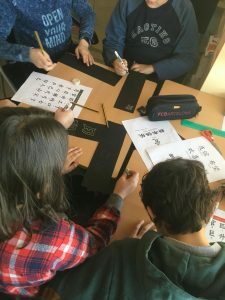 This year is the year of the pig and we have been teaching the kids about the celebrations around Chinese New Year. 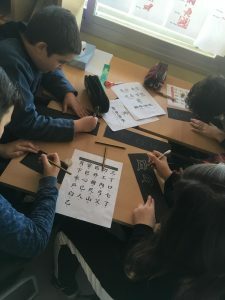 They have also been learning how to write their names in Chinese! More on the school’s twitter! Music Day at Doctor Seres! 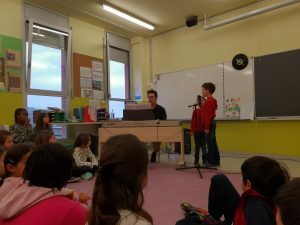 Recently at Doctor Seres we all celebrated the annual music day and my goodness do we have some talented students here! 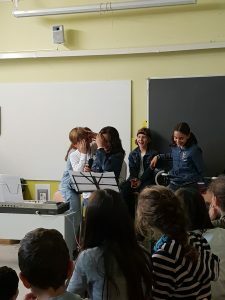 First thing in the morning, English teachers Montse and Estela told a story in Catalan accompanied by a soundtrack about ‘The most beautiful song in the world’ to the younger years which they all seemed to love. 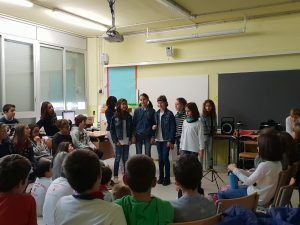 Elsewhere in the school, students were playing instruments and giving performances with visitors, one pair of students even sang an English song in Catalan. 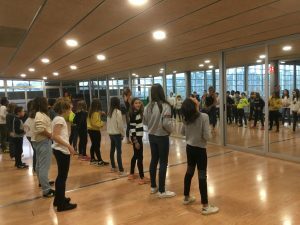 As well as this, we saw band and solo performances from year 5 (all in English which was very impressive) and other students from year 5 joined in a belly dancing class. 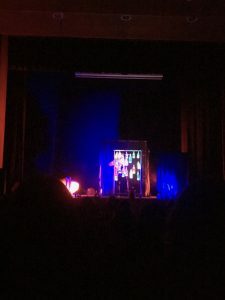 In the afternoon, the whole school was lucky enough to see a performance that involved a man playing glass bottles filled with water as musical instruments, an interesting experience I’m sure we’ll never forget! Another successful music day at Doctor Seres! Hello everyone and happy november 5th! This is an important celebration in the UK to remember the Gunpowder Plot. In 1605, a man called Guy Fawkes and a group of 12 other people tried to blow up the Houses of Parliament with 36 barrels of gunpowder because they didn´t agree with the King´s views. But one person in the group told someone in the Houses of Parliament and Guy Fawkes was found, arrested and executed. Since then, people have made bonfires and burned a ´Guy´in order to remember the Gunpowder Plot. We also have fireworks and it has become a fun family celebration! Do you have any similar celebrations here in Catalunya?! Now it´s time to start getting ready for Christmas!!!!!! Farewell Halloween until next year! Halloween has finally finished now, we hope that you all enjoyed it – after all of the rehearsals we believe that the day was a success. We no longer have to sing the skeleton song, woo! It was great to watch (and join in) the whole school singing it together. Dr Serenstein is looking very scary, you all have so much creativity. Did you get a lot sweets when you went trick or treating? Who went to the tunnel of terror? Annie and I both went and lets just say we had completely different experiences!! How did you find the theatre performance? Who won the skeleton beauty contest? Hello everyone, it´s Annie and Olivia! Here in Doctor Seres we´re all getting very excited for Halloween and have been preparing for the big day with several of our classes! We are looking forward to sharing our English Halloween traditions as well as seeing what you all get up to here in Alpicat! As well as this, year 6 have been preparing a performance for the younger years and so far the rehearsals are looking great! We will share the pictures here from the day, so stay tuned! Let´s get this party startled! I am Olivia, one of the new ´teachers´at the school, you have probably seen me ALWAYS with Annie. We started coming to school on the 1st of October and will be with you for the whole school year until June. The first week of introductions we have been coming around to all of your classrooms to show a presentation about ourselves. We hope you enjoyed it as much as we did. We are from very different places in the UK, I live close to London – in a small town called Halstead. I am excited to stay with you throughout this school year and learn all about you all! Come and say Hello whenever you see us! I´m Annie, from Newcastle (In the North of England). I´m one of the girls helping teach English in Doctor Seres this year and you will definitely see both me and Olivia around. Please feel free to say hello, we love speaking to you all! So far we have been introducing ourselves through our presentations and everyone has been really nice, and the children are all super eager to learn. 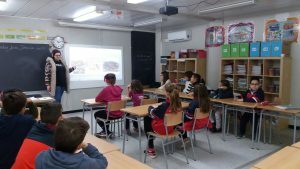 I´m excited to learn more about Catalonia and the students´ lives whilst their English improves! OUR ENGLISH DAY WAS GREAT! Theatre, games with parents, crafts, fish and chips… see the photos here! 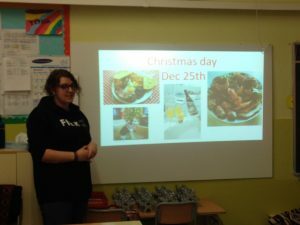 So Christmas is nearly here and over the last week I’ve been showing the children how my family and I celebrate Christmas back home in wales. I showed them the Christmas tree we have and also all the different food we eat over the Christmas holidays. 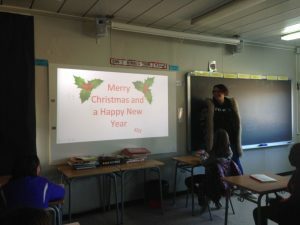 After the presentation I gave the children a worksheet with a speaking activity, which we completed together in class and also a gap fill exercise where they had to fill in the missing Christmas words. Also on the work sheet was a picture for them to colour. Over the Christmas holidays I will be choosing a winner from each class so keep your eyes peeled for the announcement of the winners. I’m sure you love this nice song: All I want for Christmas is you! Laura Jové Farreres en Your new English Conversation Assistant!